(Photos courtesy of Layn Mudder of LPT Images.) Mother Nature has been the winner the past couple of weeks at Dacotah Speedway. For a third week in a row, weather has been questionable but expectations were high Friday, June 13th. 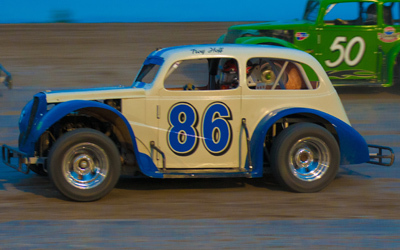 Race recap from June 13th on the high banks of Dacotah Speedway. With weather in the distance, the IMCA Sport Compact feature started the night before a quick intermission. Pole sitter Nic West and Kody Stoxen raced hard for the lead, racing side by side for several laps until Stoxen took the lead on lap three. While running second, West fell off the pace and took his car to the pits, handing second place over to Josh Roehich. Roehrich quickly caught leader Stoxen and took the lead with five laps remaining. Roehrich led the final five laps to win his second feature of the season. Stoxen who led two laps early, finished second ahead of Jamie Schalfmann, Brandon Anderson and Nylee DiMeo. 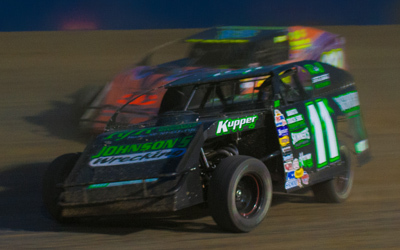 Trouble came early in the IMCA Modified concy. Bismar ck drivers Jerad Thelen and Brent Schlafmann found themselves tangled together in turn three at the start of the 12 lap concy. On the complete restart, Eric Burwick and Jeremy Keller pulled away and raced side by side for the lead. Keller would win the battle and take the lead on lap four. The race was for third, as Dwight Burwick had his hands full trying to hold off Chris Welk and Herb Bargmann. Bargmann moved to the highline, which helped him slide by Welk for fourth with two laps to go. Making a last lap charge, Bargmann and Burwick raced side by side coming to the checkered flag. Burwick finished third over Bargmann by mere inches. Eric Burwick finished second behind concy winner Jeremy Keller. Pole sitter Ben Meuchel led early in the Hobby Stock feature. 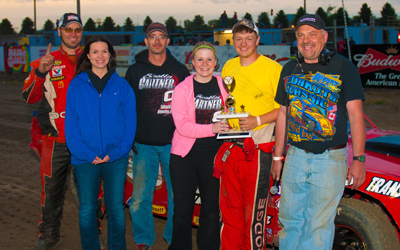 It was a three car race for second between Dana Welder, Wyatt Rath-Wald and Jaren Wald. Lincoln's Jeremy Engelhardt quickly picked off Wald, Rath-Wald and Welder and bursted into the lead by lap four. Second place Meuchel got too high off turn four and lost spots to Welder, Brent Vetter and Wald. A series of cautions helped Vetter slip by Welder for second and challenge for the lead. Vetter dove low under Engelhardt as the laps wound down but Engelhardt's highline gave him the edge lap after lap. With one lap to go, Engelhardt and Vetter raced side by side down the backstretch. Vetter threw his car hard into turns three and four and coming to the Open Road Honda finish line, Vetter just narrowly edged Engelhardt for the feature win. Jaren Wald finished third ahead of his cousin Wyatt Rath-Wald and pole sitter Ben Meuchel. Dustin Frank of Freda, North Dakota pulled away from pole sitter Shawn Volk in the WISSOTA Street Stock feature. Third place Barrett Berg tired to hold off a fast Chris Michaelson while rookie Scott Gartner lurked in fifth. Michaelson powered by Berg on lap three, bringing Gartner with him. Michaelson continued to his march to the front, picking off Volk for second and catching leader Frank a couple laps later. Michaelson took the lead on lap six but his lead was short lived as second place Gartner took the lead one lap later. Gartner pulled away from the field before a caution with 10 laps to go reset the field. Michaelson and Eric Paul restarted on Gartner's rear bumper but Gartner pulled away once again. Paul passed Michaelson on the restart as Eric Harpole and Zach Frederick battled hard for fourth. With three laps to go, Frederick had transmission problems and his slow race car collected Tanner Dosch, causing a late race caution. 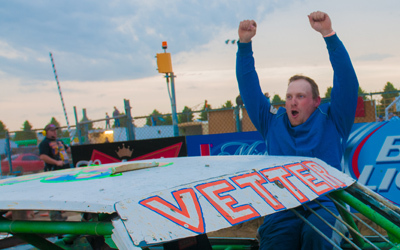 On the restart, Gartner pulled away again and went on to win his first WISSOTA feature victory at the Dacotah Speedway. Eric Paul held onto second over Eric Harpole. Chris Michaelson finished fourth while Travis Ulmer made a last lap pass on David Falkenstein to finish fifth. Wilton's Loren Anderson led the first lap in the INEX Legends feature before spinning out from th e lead. Brian Schirado inherited the lead as Donavin Wiest and Paul Morman battled for second place. Points leader Wiest bolted to the lead on lap four, bringing Shane Williams with him. An early caution regrouped the field and on the restart, Williams and young Troy Hoff were all over Wiest's rear bumper. Williams and Hoff battled side by side for second but with five laps to go, Hoff slid by for second. Hoff quickly caught leader Wiest and started challenging to his outside when the final caution of the feature reset the field with three laps to go. On the restart, Williams and Hoff blew by leader Donavin Wiest. Williams and Hoff raced side by side for the feature win. Coming to the checkered flag, Hoff dove low in turns three and four and edged Williams to the finish for his first feature victory of the year. Donavin Wiest, who led the most laps during the feature, finished third ahead of Brian Schirado and Ivan Sailer. 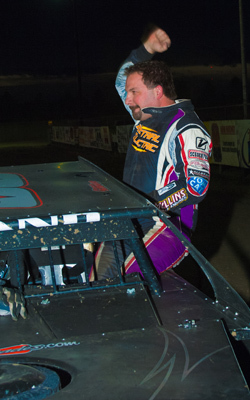 The IMCA Modified feature ended the night. Brian Swenson rocketed to the front while Drew Christianson and Jeff Taylor battled for second. Taylor took the position and reeled in leader Swenson before a caution slowed the pace. On the restart, Taylor powered by Swenson to take the lead and pull away. Swenson fell into the clutches of third place Shawn Strand and with 12 laps to go, Strand drove by for second. As the checkered flag neared, Tracy Domagala battled hard to protect fifth place from Spencer Wilson. The two drivers raced side by side before making contact and spinning out with two laps to go. The late race caution was the last thing leader Taylor wanted to see but on the restart, Taylor drove away and won the feature victory. Shawn Strand finished second while Swenson, Aaron Turnbull and Marlyn Seidler rounded out the top five. RDO brings you the INEX Legends Tour. Also on the card, IMCA Modifieds, WISSOTA Street Stocks, Dacotah Speedway Hobby Stocks and IMCA Mach 1 Sport Compacts.